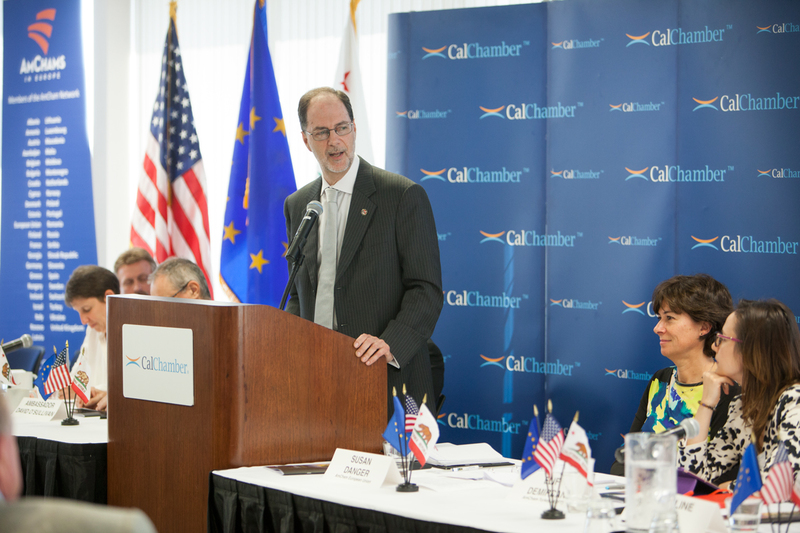 U.S. relations with trading partners across the Atlantic and around the Pacific, as well as federal Trade Promotion Authority legislation were the topics of discussion at a recent forum presented by the California Chamber of Commerce Council for International Trade. More than 200 forum attendees joined two ambassadors and representatives from the U.S.Chamber of Commerce and five American Chambers of Commerce abroad to discuss these vital international trade issues. Europe and the United States are negotiating trade talks for a potential Transatlantic Trade and Investment Partnership (TTIP) to further the largest regional trading and investment relationship in the world. The transAtlantic economic partnership is a key driver of global economic growth, trade and prosperity, and represents the largest, most integrated and longest-standing regional economic relationship in the world. Together, the European Union and the United States are responsible for 11.5% of the world’s population, nearly half of global gross domestic product (GDP), 30% of global merchandise trade, and 40% of world trade in services. The transAtlantic relationship defines the shape of the global economy as a whole; either the European Union or the United States also is the largest trade and investment partner for almost all other countries. According to Ambassador O’Sullivan, no other commercial artery in the world is as integrated. According to the World Bank, the EU market represents 506.7 million people, and has a total GDP of $17.4 trillion. The United States has more than 316.1 million people and a GDP of $16.8 trillion. Total bilateral goods trade between the European Union and United States was nearly $650 billion in 2013, with the United States exporting $262 billion worth of goods to EU member nations. 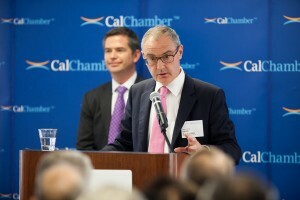 “California is the most important state actor in terms of trade and investment for the EU,” Ambassador O’Sullivan said. California exports to the European Union in 2014 totaled $29.6 billion. 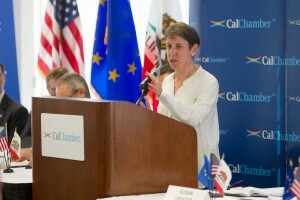 California is one of the top exporting states to Europe, with computers, electronic products and chemical manufactures as the state’s leading export sectors to the region. EU countries purchase roughly 17% of all California exports. For California companies, the single market presents a stable market with huge opportunity. EU-U.S. commercial links are unrivaled. U.S. goods and private services trade with the EU totaled an estimated $1.06 trillion in 2013, according to the Office of the U.S. Trade Representative (USTR). “The nature of our relationship is so profound and so deep and so longstanding that it’s almost hard to realize that there’s room for improvement, but the practical reality is that there is, “ said Marjorie Chorlins, vice president for European Affairs with the U.S Chamber. Tariffs on goods traded between the U.S. and the EU average less than 3%, but even a small increase in trade could have major economic benefits. U.S. trade with Europe is much larger than with China. Although there are numerous issues such as agricultural subsidies, privacy and aircraft subsidies, obtaining agreements on issues such as uniform car safety testing could be a huge benefit. Total U.S. annual investment in the EU is higher than in all of Asia, while EU investment in the U.S. far outstrips EU investment in India and China combined. According to a 2013 study by the British Embassy Washington, Atlantic Council, and Bertelsmann Foundation, the TTIP could create as many as 750,000 jobs in the United States and 75,340 jobs in California. According to the USTR, the United States and the European Union are the world’s largest sources and destinations for foreign investment. Trans-Atlantic investment benefits companies and workers by creating high-paying jobs, boosting exports, and spurring innovation in both the United States and the European Union. Jake Slegers, chair of American Chambers in Europe (ACE) offered highlights of ACE’s recent publication The Case for Investing in Europe 2015. 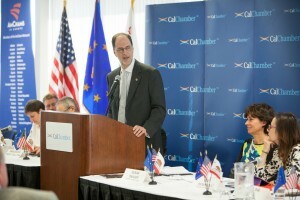 Slegers explained that the transAtlantic partnership remains critical to the long-term health of the global economy. Although Slegers didn’t shy away from some of the recent criticism of the EU economy he argued that Europe still remains among the most attractive long-term places in the world for business. A panel moderated by Stephen Brugger, vice chair of AmChams in Europe, offered perspectives on TTIP from five countries, both inside and outside the EU. Brugger was leading a delegation totaling 25 members of the AmCham community representing Bulgaria, Croatia, Denmark, Estonia, France, Greece, Ireland, Israel, Kosovo, Latvia, Lithuania, Macedonia, Norway, Poland, Romania, Serbia, Slovak Republic, Slovenia, and Turkey. These representatives were travelling in California to San Francisco, Silicon Valley and Sacramento, and concluding their annual journey in Washington, DC. “TTIP is the architecture for the next 50 years and that’s what we have to communicate,” said Brugger. Brugger turned the panel over to AmCham directors from the EU, France, Slovak Republic, Greece and Turkey to offer other points of view. Speaking for the EU, Susan Danger, managing director of AmCham EU, said “The basic view for business is that TTIP is good.” Danger’s chamber represents 162 American companies operating in the EU. However, she said her chamber has changed the way it communicates about TTIP in the last 18 months because the naysayers’ voices are growing louder than the yeasayers because there is deep distrust and something must be done to combat that. Ryan offers some hope, however, saying, “There’s a real equilibrium between the two countries and a real, strong dialogue between the two countries.” She reminded the attendees that French companies form the third biggest business community in the United States, generating 560,000 jobs and that France is one of the top five foreign investors in the U.S. On the flip side, the U.S. remains the first job creating investor in France, with more than 500,000 jobs. Slegers illustrated the importance of TTIP with a factoid that he doubted anyone in the room would know: the Slovak Republic is the No. 1 producer of automobiles per capita in the world. The republic produced 980,000 cars last year. The per capita distinction is especially important because the Slovak Republic has only 5 million people and three car manufacturers are located there. “With the reduction of tariffs, the removal of trade barriers and standardization… even a fraction of an ability to increase our imports will have a major impact on our economy and so we are in full support of TTIP and we keep beating that drum,”Slegers said. Elias J. Spirtounias, executive director of AmCham Greece, says that TTIP offers Greece an opportunity to expand and become a very major energy and trade hub within the southeast European region. The final panelist, Elif Demircan, executive director of AmCham Turkey, offered a unique perspective from a country that will benefit from TTIP, although it’s not an EU country. The chamber represents 130 U.S companies that have invested more than $50 billion in Turkey, creating more than 60,000 jobs. Ambassador Kurt Tong, principal deputy assistant secretary with the U.S. Department of State, closed the event with his perspective of what’s happening with Trade Promotion Authority (TPA). Trade promotion authority (formerly called fast track trade negotiating authority) is the process by which Congress gives authority to the President and/or U.S. Trade Representative to enter into trade negotiations in order to lower U.S. export barriers. Traditionally, following the conclusion of negotiations for a trade agreement, enabling legislation is submitted to Congress for approval. Once legislation is submitted, under trade promotion authority, both houses of Congress will vote “yes” or “no” on the agreement with no amendments, and do so within 90 session days (not to be confused with a treaty, which is “ratified” by the U.S. Senate). During negotiations, however, there is a process for sufficient consultation with Congress. The U.S. Senate passed TPA last week and the House should be taking it up soon. Most important, Ambassador Tong noted, these rules will be binding. Foreign policy and economic policy are definitely interlinked, and both TTIP and TTP are examples of that fact. “They are absolutely essential and key elements in bringing together global rules in the right direction and also bringing together critical relationships,”Tong said. The United States, Australia, Brunei Darussalam, Chile, Canada, Japan, Malaysia, Mexico, New Zealand, Peru, Singapore and Vietnam have made substantial progress toward completing the Trans-Pacific Partnership (TPP) negotiations. In addition, more countries may join the trade partnership. “These agreements, once reached will have this magnetic effect that raises global standards worldwide,” the Ambassador commented. A TPP agreement provides global income benefits of an estimated $223 billion per year, by 2025, according to a 2013 analysis supported by the Peterson Institute. Real income benefits to the United States are an estimated $77 billion per year. The TPP could generate an estimated $305 billion in additional world exports per year by 2025, including an additional $123.5 billion in U.S. exports. To dispel the misinformation about TPP and TTIP, Ambassador Tong elaborated on what the agreements will not do. 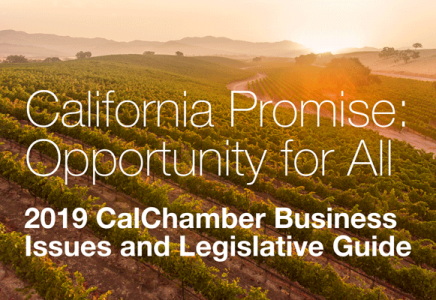 The CalChamber is urging the California congressional delegation to quickly pass The Bipartisan Congressional Trade Priorities and Accountability Act of 2015 (TPA-2015) because it will help boost U.S. exports and create American jobs. The bill was introduced April 17 by Senate Finance Committee Chairman Orrin Hatch (R-Utah), ranking Senator Ron Wyden (D-Oregon) and U.S. House Ways and Means Committee Chairman Paul Ryan (R-Wisconsin). 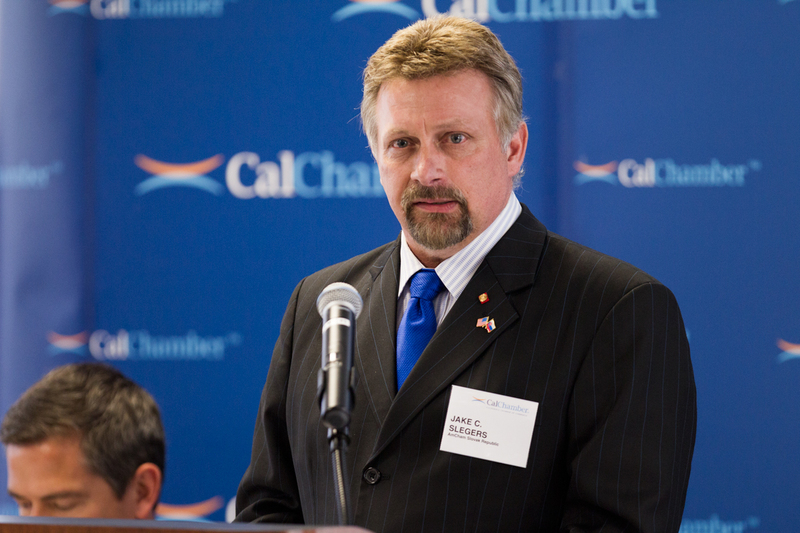 For a sample letter, visit the CalChamber grassroots page.